Ensuring a safe and secure learning environment. 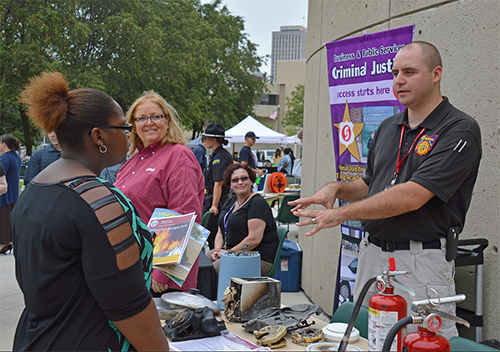 The men and women of the Department of Public Safety are dedicated to maintaining a safe environment. The Department of Public Safety and Sinclair Police serve the campus 24 hours a day, seven days a week providing emergency services, responding to criminal and non-criminal incidents, providing escorts to your vehicle or assisting in finding a lost item. Personnel are dedicated to providing the very highest quality service to our college community, including students, faculty, staff and visitors to our campuses. Public Safety continually provides information via this website. You can also sign up up for Sinclair's emergency alerts system which will notify you via phone, text, and/or email if an emergency should arise on or near campus. If you need to report an emergency or an immediate threat, contact Sinclair Police at 937-512-2700 or dial 911 from any campus phone. We can only achieve a truly safe campus through the cooperation of the campus community. Each of us must assume personal responsibility by reporting crime and taking precautions to prevent ourselves from becoming a victim. Use the safety tip and information line form below to advise the Sinclair Police of safety related concerns. The Department of Public Safety has the responsibility for ensuring that police personnel respond in a professional manner and abide by proper police procedures in all circumstances. You can file a complaint or concern at www.sinclair.edu/complaint. All complaints and concerns are received, reviewed and addressed accordingly. develop a concern for the safety of all other College constituents. Employees can find information on the safety program, safety policies and instructions inside of the Employee Safety Manual. In continual commitment to safety awareness and providing a safe and secure environment, Sinclair each year publishes an Annual Safety Report (ASR) highlighting crime statistics, safety awareness programming, student conduct information, and other information on campus crime and incidents. Sinclair Police maintains a continuous liaison with Dayton Police especially when a serious crime occurs on adjacent streets or sidewalks to the campus. Whenever a serious crime or incident occurs on campus or on a street immediately adjacent to campus, an alert is issued to the entire campus community.